Railpictures.ca - A.W. Mooney Photo: CN 5047, 5525 westbound pass the old Canada Crushed Stone Ltd facility near mile 4, Dundas Sub. This image, while a tad grainy, shows a rather open view of the old rail siding which led up to the large screen house . Operations before shutting down in the early 1970s consisted of stone quarried up on the mountain brow (Dundas Peak)going thru the High Brow Crusher (demo’d 1975) and then down to the Screen House (demo’d 1993)and then over the CN mainline via the gantry (demo’d 1986)conveyer belt and stockpiled on the south side for later shipping. Interesting in this image is the hopper at the base of the incline trackage. This steep grade operated by cable pulling cars up the grade, supplies usually went this way. Perhaps this car was held back for use in removal of some equipment as the shutdown was finalized. Steetley Inc., which purchased the CCSL in 1951, maintained a small shipping facility south of the tracks until the early 1980s. Walking the area today, it is hard to imagine the landscape being so open. All that remains now is the incline bed, which is now a hiking trail; all rail is gone but a lot of old ties remain. | Railpictures.ca – Canadian Railway Photography – photographie ferroviaire Canadienne. Caption: [Editors note: historic] CN 5047, 5525 westbound pass the old Canada Crushed Stone Ltd facility near mile 4, Dundas Sub. This image, while a tad grainy, shows a rather open view of the old rail siding which led up to the large screen house . 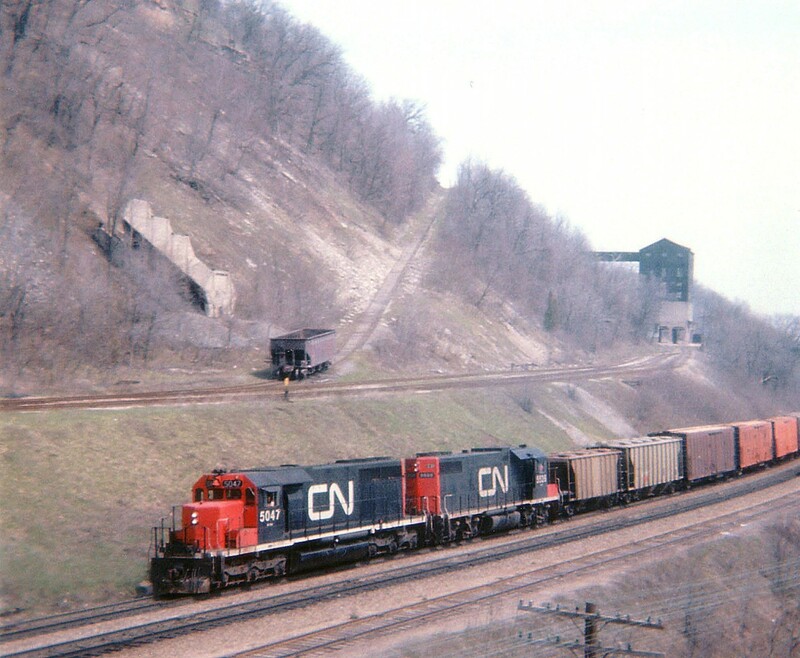 Operations before shutting down in the early 1970s consisted of stone quarried up on the mountain brow (Dundas Peak)going thru the High Brow Crusher (demo'd 1975) and then down to the Screen House (demo'd 1993)and then over the CN mainline via the gantry (demo'd 1986)conveyer belt and stockpiled on the south side for later shipping. Interesting in this image is the hopper at the base of the incline trackage. This steep grade operated by cable pulling cars up the grade, supplies usually went this way. Perhaps this car was held back for use in removal of some equipment as the shutdown was finalized. Steetley Inc., which purchased the CCSL in 1951, maintained a small shipping facility south of the tracks until the early 1980s. Walking the area today, it is hard to imagine the landscape being so open. All that remains now is the incline bed, which is now a hiking trail; all rail is gone but a lot of old ties remain. Wow what a photo! I recall climbing around the remnants in the late 80s or early 90s. I was baffled that such a dangerous place (open pits) would be so accessible. I have never seen the facility in a working state. Remarkable. As an aside…and there is no delicate way to ask this, there is an awful lot of recorded history in these photos. What would happen to it in the even the site owner passes? This should all be kept safe for generations to come. Glad you appreciate the scene. Yes, I too did a lot of wandering in that area. I remember the double tracked “main line”, also an old stone house, some outbuildings, the Plymouth switcher #7 parked and rusting and a lot of other misc relics. A book at the weigh scales informed me truck drivers made $2.+change per hour!!! How times have changed. Nowadays I look at the incline and say to myself, “the hell I am climbing up THERE”. Looks farther than it did when I was younger. This is a great image, I used to go hiking here when I was a kid and remember exploring the abandoned right of way and would imagine what all the concrete foundations used to support. At that time the screen house was all that remained; wish I’d taken some pictures back then…Thanks for bringing back the memories, Arnold. That’s really interesting. I had no idea of this. Also cool that the track is at such a steep incline. Wow! Amazing installations on the side of the hill. Imagine the coal car breaking loose on top of the hill.